As a huge fan of Riot's Thundersteel album, I have been anticipating this album for what seems to be years since I first heard of the collaboration. 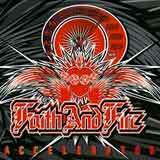 Faith and Fire was formed in 2002 by Tony Moore and Mike Flyntz; Moore fronted Riot's Thundersteel and Privilege of Power albums, and Flyntz has been with Riot since the Nightbreaker album. Joining these two are bassist Danny Miranda of Blue Oyster Cult and drummer John Miceli of Rainbow. Finally, the band's debut album is upon us. With such a pedigreed lineup, my expectations were quite high for this album. While Accelerator is not the classic that I had hoped, it's a good dose of raw, hard edged melodic rock that will satisfy many Riot fans at the very least. For those of you familiar with Tony Moore, I can't imagine that you were expecting another Thundersteel album with this release. While I treasure that album, it was recorded nearly twenty years ago (man, I'm getting old) and the musicians involved are in much different places now. Tony's vocals aren't perched in the highest of octaves for most of the album as they were in his old Riot days. Instead, he sticks with a predominantly mid range delivery, although he frequently whips out the high pitched shrieks proficiently which is a pleasant surprise for me. Moore clearly still has strong pipes, and he uses his voice a lot more effectively than in the past. His voice is powerful and melodic in both the middle ranges and in the higher octaves. Some of the more average tracks of the album shine a little brighter thanks to Moore's charismatic performance. I had honestly expected Moore's voice to show more age, and certainly did not expect any of the shrieks on this album. Obviously, the vocal performance on this album is a pleasant surprise for me. As far as the music goes, the songs are pretty far removed from the power metal of Thundersteel. Instead, the guys are playing groovy hard rock the ventures into melodic metal territory from time to time. The sound of the album is very raw, much like a live in the studio effort. While the sound is a bit rough (the drumming is the most noticeable example), this does give the songs an energetic and "loud" vibe, even though the tempo isn't full throttle. There are very few overdubs at all on this album, which is a bit uncommon for a release in this genre. Ready gets the album started, and it exactly the killer tune that should open an album. It is a politically charged rocker than viciously damns maligned United States President George W. Bush. The directness of the lyrics surprised me upon first listen, but it is a sentiment that I'm sure many share with the band. The raw, heavy, and crunchy guitars from Flyntz go perfectly with the vibe of the song, making for a memorable start to the album. Moore unleashes some chilling shrieks at just the right spots to really seal the deal for this track. Villanelle in the next track, and quickly demonstrates the diversity of songs this band is capable of creating. It's a heavy, but slow and melodic cut with keyboards to give it a haunting atmosphere. The rhythm is slow, but very deliberate as it chugs along. Moore's performance during the chorus lines is absolutely fabulous. Everything follows, and it is a straightforward, up tempo rocker with a heavy groove. This cut features one of the most memorable hooks of the album. From this very strong start to the album, Accelerator takes an up and down course for the duration of the album. Radio Superstar is another hard rocking tune with a catchy chorus line, but the silly lyrics are just too much after repeated listens. Breathe is the first ballad of the album, and it's a good, but not grabbing cut. The opening riff reminds me of early, bluesy Whitesnake. Blues fans will probably enjoy this one more than I do, as Flyntz lays down some intricate blues inspired solos in the middle of the cut. It's not a particularly catchy tune, but the musicianship is what really makes this song. The title cut is next, a mid tempo rocker that does not quite measure up to previous standouts of the album, but it is a grower. The biggest issue here for me is that Moore seems to want to sing with more energy and tempo than is provided by the music. Again, the chorus line is catchy as hell, so that is worth something. After several listens to this track, it is growing on me as the lyrics are pretty interesting. Fallen is next, and Moore does have the opportunity to sing with more energy and fire on this one. Flyntz nails some driving metal riffs which are accompanied by a thunderous rhythm section. Moore adds his soaring and energetic vocals to make this a metal anthem not too far at all from Thundersteel. The energy built by this track is quickly cooled by the mediocre ballad, Ashes. Moore's delivery and some nice leads from Flyntz save the song, but another rocker in its place would have been much better, especially with the presence of two other (better) ballads on the album. The blues influences are again brought out in full force with Avenue Z, a groovy and catchy uitar heavy cut about some of the eye popping things you might encounter in Brooklyn. Although blues rock isn't my preferred style, Moore unleashes some fantastic lead vocals on this track, while Flyntz doles out some outstanding solos and leads throughout. Hence, I have to say that this is a hightlight of the album. Accelerator follows, which is a heavy, guitar driven rocker with a dark vibe. Flyntz provides another precise, chugging rhythm. The vocals during the verses are a bit awkward, as they are partially spoken in spots, which doesn't gel with the guitar work very well. However, another well done chorus and yet more intricate and dazzling solos from Flyntz to go along with the pounding rhythm rescue this track. Angel is next, and it is the best ballad of the album. A strong, chorus line and a guitar solo that almost sings for itself makes this a classic power ballad. The album closes with a surprising throwback to Thundersteel (even more so than Fallen), America. Moore turns back the clock a few years and sings in the higher octaves for this energetic metal anthem. Flyntz' rhythm is similar to recent Riot, with Kings are Falling coming to mind pretty readily while jamming to this cut. Catchy, heavy, and Moore effortlessly belting out the high shrieks maybe even better than he did twenty years ago makes this another highlight of the album. While Faith and Fire set the bar rather high with the albums first three tracks, there are plenty of highlights to follow, although some lesser material is sprinkled in. With one well done ballad at the end of the album, I could have done without the other two mediocre ballads that somewhat disrupt the otherwise very energetic flow of the album. Some very thoughtful lyrical content can be found on this album, with lyrical missteps such as Radio Superstar being the rare exception. While not many of the songs themselves are spectacular in nature, Moore's vocals and the chops laid down by Mike Flyntz simply elevate the entire album. Having said that, the songwriting just isn't strong enough on a consistent basis for me to call this the classic that I had hoped it would be. Still, there are enough strong moments on this album to please most, if not all Riot and Tony Moore fans. The raw sound may rub some the wrong way, although it does capture the energy of the songs very well. For a debut album, I am impressed with the final product. I do see room for the band to improve, but I like what I hear so far. It's great to hear Tony Moore back in action, and I really hope that this isn't a "one and done" effort from Faith and Fire.